Frauds targeting real estate lawyers are getting ever more sophisticated. 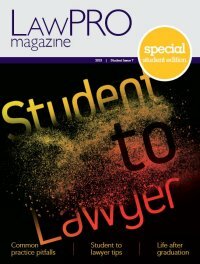 LAWPRO has seen several attempted frauds involving corporate identity theft. The properties involved may be commercial or residential, but are always owned by a corporation. These frauds start with the fraudsters changing or stealing the identity of corporate property owners. This is most commonly accomplished with the filing of a Form 1 Notice of Change naming new directors and officers. On occasion, we have seen the fraudsters change the address of existing officers and directors in an Annual Return filing. The fraudsters use stolen or fake identification corresponding with the names and addresses of the imposter officers and directors. In some cases, the fraudsters retain a lawyer to prepare and file the Form 1; in other cases, they prepare and file it themselves. The fraudsters then retain a lawyer to help them sell or mortgage the corporation’s property. Private lenders are often involved and existing mortgages on title may be fraudulently discharged. The fraudsters will go to great lengths to make these frauds appear to be legitimate transactions. As noted above, they will have stolen or fake identification matching the names that will appear in corporate records. Multiple people may come to the lawyer’s office, although there is typically one “front man” who deals with the lawyer. They will produce a minute book that will be current and include recent corporate resolutions. 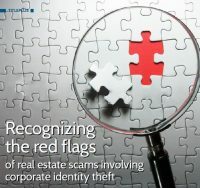 In one fraud involving the purchase of a vacant $1.3 million property with a $600,0000 mortgage from a private lender, other individuals that appeared to be in cahoots with the imposter vendor filed a Form 1 to assume the identity of a corporate buyer. They retained their own lawyer to act on the deal and also created a fake minute book. Client will push for fast closing. The fraudster clients will not be interested in following up on or solving the issues of concern you raise. They will discourage any efforts to investigate the corporation and the property – another red flag! If you see one or more of these potential red flags, dig deeper before you complete the deal. Do not close unless the red flags you have spotted have been explained to your complete satisfaction. While one red flag may not be a problem, dig deeper if you see multiple red flags. We have seen fake Ontario driver’s licences used on a number of these frauds. For a nominal fee (just $2.50) you can check whether they are fake with a licence number search on the MTO’s website. Check addresses and the satellite view of the property on Google Maps. You can see what is at the property with Google Street View, and a personal drive-by is another option to see the status of the property. Do not use contact information provided by the client – if he/she is a fraudster, they have associates standing by with plausible answers. Check the Document Last Filed in the Corporate Profile Report. It will likely be an Annual Return, but could be a Form 1 – a possible red flag. A Corporate Document List search will disclose a history of the documents filed for the corporation. Ask for details of the change in control of the corporation, or permission to contact the corporation’s previous lawyer, agent, directors or officers. put into making frauds look legitimate. Watching for the above red flags will help you avoid these scams. Keep asking questions if things don’t add up. Refuse to act if you are not 100 per cent comfortable with the answers. Lisa Weinstein is Vice President, TitlePLUS and Dan Pinnington is Vice President, Claims Prevention and Stakeholder Relations at LAWPRO.